Chevrolet 200-229 V6, 283-400 V8 1955-57 (ex.Corvette). Mr.Gasket's own quick-change cam kit eliminates the need for dropping the oil pan during the replacement of the timing chain or timing gears. This kit is highly recommended for advancing or retarding the camshaft. Quick and easy installation is possible. 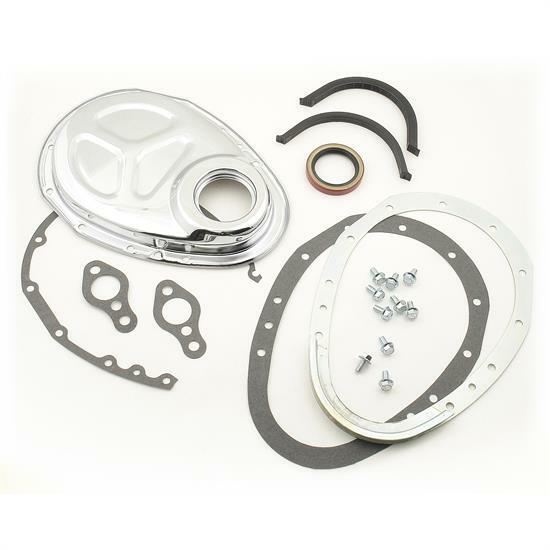 The kit includes a complete set of gaskets, retainer and timing cover. This quick change 2-piece chrome plated timing cover kit fits small block Chevy.